FOR SEVERAL weeks now murmurs of lingering feud between President George Manneh Weah and his Vice President Jewel Howard Taylor have triggered waves of speculations that all is not well and may be on the verge of spilling over. THE REPORTS OF a feud have been heightened by attempts by President Weah to command control and influence over all three branches of government with the elimination of tenured positions and an all out effort to have embattled Associate Justice of the Supreme Court of Liberia, Justice Kabineh J’aneh impeached. PRESIDENT WEAH has of late been exhibiting early signs of the dictatorial tendencies which defined some of his predecessor including late President Samuel Kanyon Doe and former President Charles Ghankay Taylor. ALL THIS COMING as voters have sent a clear and succinct message in the just-ended legislative by-elections in District No. 13, Montserrado County. THIS IS A PART of Monrovia vacated by former Representative Saah Joseph which has been dominated by the ruling party for the past decade. PRESIDENT WEAH not only openly campaigned for the party’s candidate John Weah but took key members of his administration on a late-campaign rally to lift the hand of the candidate in hopes of securing victory. TO THE SURPRISE OF MANY, who had all but resigned to yet another CDC victory in the district, the underdog, Edward Flomo emerged as the winner. FLOMO, IRONICALLY had been a long-time Weah aide who was trampled upon in his quest for the party’s ticket. His victory all but sealed the notion that the days of Weah putting up a candidate’s hand in certainty of victory may be nearing an end. THE OTHER RESULT in Sinoe remains highly contested as the National Elections Commission investigate issues of alleged foul play. WHAT WE ARE puzzled about is why is Mr. Weah allowing his presidency to degenerate so soon? Why is the President failing to do the simple things needed to put in place a structure that could lift the hopes of those who looked up to him as the prince of Gibraltar primed to rescue them from the trenches of poverty. WHAT IS EVEN more troubling is the President’s reluctance to put his renegade Monrovia City Mayor Mr. Jefferson Koijee in check. MR. KOIJEE has said idly by while the city lies in filth as he parades himself around with a team of red beret instilling fear in voters and resurrecting clouds of an ugly past that brought nothing but torment and chaos to Liberia. HOW SOON can Liberia forget? Memories of the controversial Black Berets, an elite security force formed by the Interim Government in 1991-1992 to combat crime in Monrovia. ALL THIS COMING as reports continue to linger about the training of a militia outside of Monrovia to protect President Weah and his personal properties currently under construction. THESE TRAININGS ARE reminiscent of the days of Doe’s reign in the 1980s. The late President established a Special Security Service which had overlapping functions to other security agencies resulting into problems with the “unruly” behavior of the security forces. After the 1980 coup, the Doe government purged most of the professionalized SSS officers and replaced them with members of Doe’s ethnic group, the Krahn. DURING THE DOE ADMINISTRATION, the SSS as well as several other security forces were coordinated by the Joint Security Commission. It included the Ministers of Defense, Justice, and National Security, as well as the heads of the military and the police. But as resistance to the Doe government grew, human rights violations became widespread. Torture, disappearances, extrajudicial executions, imprisonment of opposition leaders, and restriction of freedom of expression were all commonplace violations of human rights under Doe’s government. As Doe’s power base diminished, he began to rely on the Armed Forces of Liberia (AFL) to carry out atrocities. IT IS NOT TOO early to raise these red flags which is why we continue to appeal to the conscience of President Weah to see reason to redirect his priorities from his false fears of insecurities leading to the formation of militia to protect himself. THE PRESIDENT HAS instead allowed corruption to grow by his refusal to publicly declare his assets and lead by example. The construction of numerous personal properties is a key reason why many of his officials are following his lead with the purchase of numerous homes in broad-day light costing millions of dollars in unexplained sudden wealth. THE PRESIDENT is doing more harm to himself by overseeing a government without transparency and accountability. THE RECENT ARREST of the head of the National Housing Authority(NHA) Mr. Duannah Siryon and his deputy Tugbeh C. Tugbeh who along with Mr. Augustine Weah are heard on a leaked recording discussing kickback payments from a Burkinabe company to several senior government officials, including President Weah and his minister of state, Nathaniel McGill, shows how gravely the lack of responsible fiscal and governance policy is hurting the administration’s image. THIS COUPLED with the missing billions in local currency and the shrewd explanation from Finance and Economic Planning Minister Samuel Tweah regarding how some US$25 million infused in the economy was dispersed have added to mounting suspicions about Mr. Weah and his officials. Bypassing the Central Bank of Liberia to divide money amongst money changers paints a rather disturbing picture of a new government in peril. WE HOPE THAT IN TIME, President Weah will realize the damage he and his officials are doing to the hopes and aspirations of the many grassroot supporters who threw their support behind his candidacy and rode on his shoulders to the presidency. 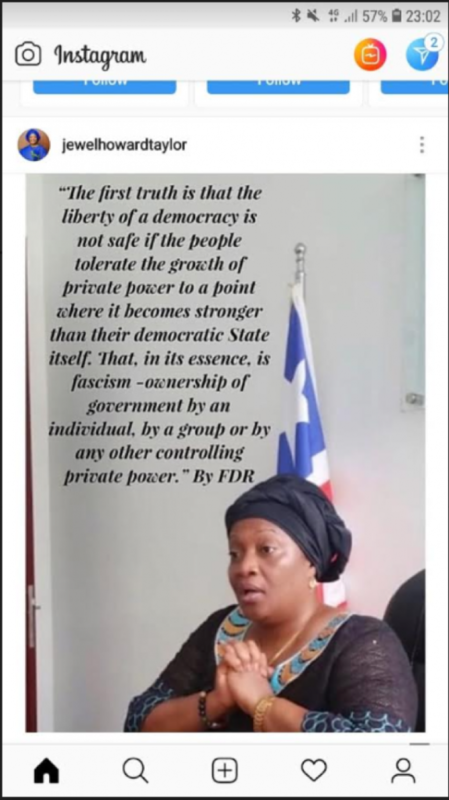 IT IS NO COINCIDENCE that Mr. Weah’s Vice President chose an opportune time to post a cryptic quote from late US President Roosevelt in one of his famous letters to the 75th Congress on Anti Trust Law in the United States. IT DOES NOT TAKE a rocket scientist to guess that sycophantic followers of President Weah have begun running to him with his vice president’s cryptic post in hopes of further deepening wounds between the pair. WHAT MR. WEAH should be doing now, is deciphering Roosevelt’s message which from all indications, mirrors the predicament he currently finds himself engulfed in; a predicament in which he is regularly shielded from the realities on the ground, while crushing the hopes of those still holding out hope and praying that the change they yearned for and believed in, will bring them the hope they need to restore semblance of sanity amid a looming threat of a recurring nightmare from Liberia’s ugly past.